Kanak said that ritual had to be done by both. Viplav told Raja to put his feet. Viplav put water. Raja felt irritation and stated that he must have added salt. Viplav thought to teach him a lesson. Kanak told viplav to leave as Raja is asking to stop. Viplav said that it was strange he stopped him, but he wouldn’t have stopped Dhaani. Raja said he would not have any physical relation with her, but they insisted. Dhaani told Shalu that Raja is not nice and married for money. She stated that they hadn’t consummated as Kanak haven’t accepted her and asked shalu also the same. Shalu promised. Raja came to the room and asked Shalu to make the night memorable. Shalu apologized and said that she also waited but wanted to wait for a month till everyone realized their love. Raja agreed and thought what happened to her. 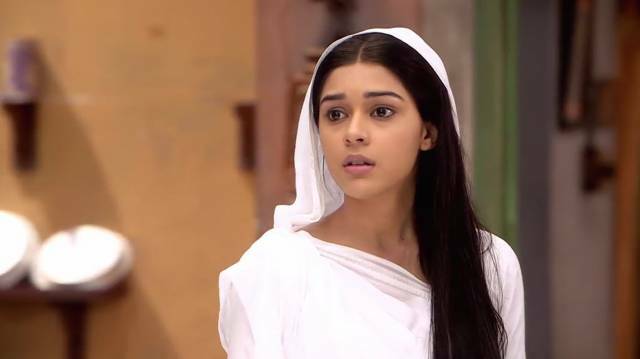 Dhaani believed to send Raja out and said to viplav that he wouldn’t do anything for a month. Raja saw Viplav’s decorated room and thought it was beautiful. Shalu said it was Viplav’s room, and she never asked. Raja said to think about her happiness. Dhaani came. Raja greeted and left. Shalu asked her about her wedding gift. Dhaani asked what she wanted. Shalu asked her to give her room as a gift. Viplav said that it was not her thought but raja’s. Dhaani asked him to give room and let him think he won. Viplav agreed. Raja apologized to viplav. Shalu asked Dhaani to make her husband understand that she doesn’t like Raja to be unheard. Raja said he might be feeling bad. Dhaani said it didn’t matter to them both. Shalu told Raja that Dhaani was illiterate. Dhashrath asked viplav and Dhaani why they changed the room. Sushma said she would talk to Shalu. Dhani said she was the daughter of the house and let her stay. They came to other room. Viplav stated that you gave the room in charity which was for their honeymoon. Dhaani asked him to cool down. Raja came to give Dhaani’s saree. Dhaani asked him not to touch her stuff. Viplav grabbed his shoulder and said saale. Raja said jija and you were saale. Shalu scolded Viplav to misbehave with Raja. Dhaani asked Viplav to cool down….